Five Westbrook Junior College students stand side-by-side in this sepia toned candid snapshot labeled 1934 on the front. Three of the five young women wear heavy winter coats with fur collars; the other two wear storm coats, one belted, one unbelted and open. 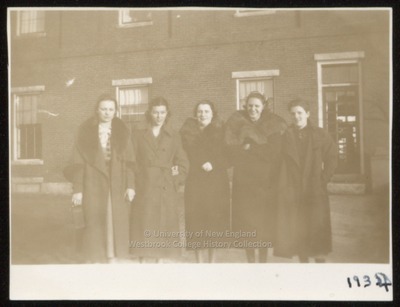 The five young women stand on the side of a brick building with windows, possibly Hersey Hall or Goddard Hall. On the back of the photo is written in pencil: "Barbara Alton, myself," [Frances Savage] "Annie, Beulah, Shirley. Sweet bunch, eh?"